A yummy Gujarati dish. Traditional and very simple to make. This one here is Khandvi but with my little twist to it. Makes good evening snack or a light morning breakfast. Grind to a paste 1 green chilli, ginger, coriander. Mix this paste into the buttermilk. Add salt, asafoetida, turmeric powder. In a bowl, put the gram flour and pour the buttermilk slowly while stirring to avoid lumps. Break any lumps if formed till this mixture is completely liquefied. In a small pot, heat 1 tsp oil. Pour this mixture into the pot stirring continuously.Keep stirring as the mixture thickens else it will form lumps.As the mixture starts to leave its sides, using a tsp, apply the mixture thinly on a dry plate. Once it cools down, it should come off the plate smoothly. This is the right consistency. Take the mixture off the fire.On dry plates, spread the mixture evenly. Use a flat bottomed ladle or a spatula to be able to spread the mixture evenly and thinly.It is easier if done in a circular motion like when spreading dosa batter on a tawa, starting from the inside and moving outwards. Cut into 1 inch strips using a knife. Roll the strips like a scroll.Continue similarly for all the plates of spread out mixture. Heat the remaining oil. Add the cumin powder, mustard seeds, green chilli slit lengthwise, curry leaves and a pinch of asafoetida. Alternatively, seseme seeds and/or dry red chillies can also be added. 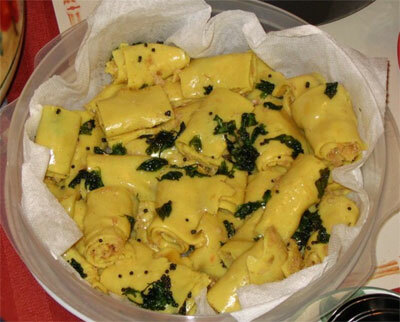 Once the mustard seeds splutter, pour this seasoning over the Khandvi rolls. Garnish with grated fresh coconut. Serving Suggestions: can be served with Mint Chutney, Tomato Ketchup, Tamrind Chutney, Chilli Chutney or any other suitable dip or chutney. WOW! This i s a great dish for the morning i could eat it everyday.